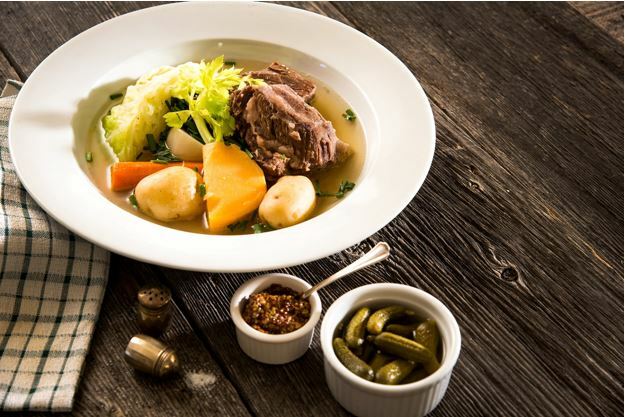 Pot-au-feu which means “pot on the fire” in France is very similar to the Italian Bollito Misto or to a New England or Irish boiled dinner. Piquant, briny condiments are usually served with the meat to counter the richness. Though you may be tempted to add the potatoes right to the pot, that would “trouble the broth,” as the French would say, making it cloudy. Cook them separately to keep the broth clear. Tie the parsley, thyme, and bay leaf with kitchen string to make a bouquet garni. Tie the leeks into a bundle. Put all of the meat in a 10- to 12-quart stockpot. Cover with cool water by 1 inch and bring to a boil over medium-high heat. Skim the surface of the liquid in the pot, and add the bouquet garni, leeks, carrots, celery, turnips, rutabaga, garlic, onion, 2 tablespoons kosher salt, 1/2 tsp. pepper, and enough water to just cover the meat and vegetables. Return to a boil, skim again, turn the heat down to low, and partially cover. Cook at a very gentle simmer, skimming off any foam, until the vegetables are tender and the meat is very tender. The meat will take 2 to 2-1/2 hours, but start checking the vegetables after 20 minutes and transfer each to a platter as it’s cooked. Meanwhile, boil the potatoes separately in lightly salted water until tender, about 15 minutes, and drain. Set aside. Transfer the meat to a large platter and cover with foil to keep warm. Discard the bouquet garni and leeks. Put the potatoes and the other cooked vegetables into the broth to reheat for a few minutes, then transfer them to the platter with the meat. Ladle enough broth over the meat and vegetables to keep them moist, cover with foil, and keep warm in a low oven. Strain the broth if you think it needs it. Serve the meat and vegetables as the main course along with small bowls of flaky salt, mustard, creamy horseradish and cornichons. Note: The French almost always add a marrow bone or two to pot-au-feu. Aside from adding flavor, marrow bones release gelatin into the broth, which gives it more body. If you use other gelatinous cuts, such as oxtails or shank, marrow bones aren’t crucial. If you do use them, though, you’re in for a treat: The cooked marrow, which slides out of the bone with a little coaxing, is wildly delicious; it tastes rich and meaty but has the consistency of soft butter. Try some smeared on the toast served with the pot-au-feu broth, topped with chopped parsley and sea salt.